This is a recipe based on handwritten notes from my grandmother, who ran a lakefront resort in Northern Wisconsin. Unfortunately, her recipe didn’t specify actual ingredient measurements — in retrospect, she may have felt she didn’t need documentation due to the sheer volume of made-from-scratch bread she produced each week in that old maple-fired wood stove. 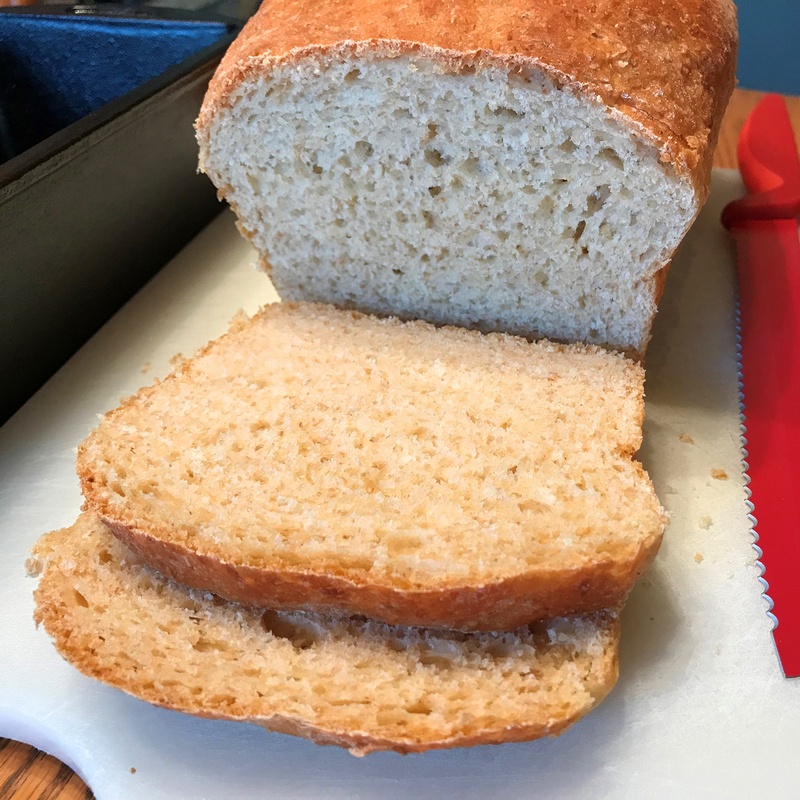 I have tried to recreate her recipe by working with measurements from King Arthur Flour’s website, but their recipes use four cups of flour which produce a much larger loaf (hey, they are in the business of selling flour.) As a result, my initial tests produced a very dense loaf that invariably fell flat. 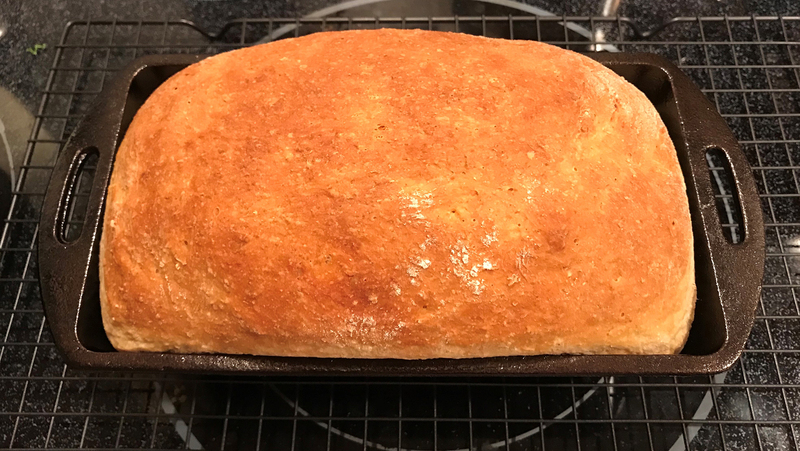 After several failed attempts, I now have a very close rendition to her amazing bread. This loaf is excellent when served as toast, and has a wonderfully-textured crumb. Enjoy – this bread brings back so many great memories of my Northwoods childhood. Carefully sift and measure the flour, then level. Do not pack by tapping the measuring cup, or your loaf will be too dense. Combine with the other dry ingredients in a food processor fitted with a dough blade. Turn on the processor and slowly add the warm water. When the ingredients start to pull away from the bowl surface, stop. Remove the dough and place on a very lightly-floured work surface and continue to knead for one minute. The dough should be very elastic and only slightly tacky. Form it into a round ball. Place the dough ball in a greased 8-cup mixing bowl and cover tightly with plastic wrap. Set your timer for 1 hour and 30 minutes. When the dough has doubled, (it may take up to 2 hours) remove and very gently punch down. Form into a log that will fit a standard greased 9″ x 5″ loaf pan. (I highly recommend Lodge cast-iron for its even heat distribution; you’ll get a much better crust.) Cover the pan loosely with plastic wrap and set aside again for 2 hours. While the dough is in the second rise, preheat your oven to 350-degrees F.
Place the loaf pan in the oven and bake for 35 minutes, uncovered. An accurate instant-read thermometer should read 195-200-degrees F. in the center, when done. The crust should be an even golden-brown. Remove promptly from the pan and allow the loaf to cool completely on a wire baker’s rack. Wrap in a plastic bag, or cut and serve for immediate use. For white bread: Substitute 1 cup white flour for the wheat flour. You can place the dough in a non-heated oven with the oven light turned on. This will create a warm environment that aids in a more consistent rise. This is very helpful in colder months when ambient room temperatures may affect the result. Culinary Compost never endorses products for profit, and has received no monetary compensation for the content of this post. This fantastic recipe will fill 2 large loaf pans. Thanks to my friend Sarah for sharing. Fold in the rest of the ingredients shown above using an electric hand mixer on the lowest setting. Line two standard-sized loaf pans with parchment paper. Divide batter between the pans. Bake for 1 hour. Then increase the heat to 350 degrees and bake for an additional 10 minutes. When done, a knife or toothpick should pull out clean when placed in the center of each loaf. Remove, let stand ten minutes, then cut into 1/2″ slices and serve with real butter. This ridiculously-simple recipe is a Swedish favorite from my grandmother. Preheat oven to 300°. Heat the butter over the stove top in a 2-quart cast-iron pot until melted. Mix in the brown sugar, apples and cinnamon. Bake covered for 1 hour. Serve plain or with vanilla ice cream in small serving dishes. This is a great recipe that keeps well when reheated the second day. The green chili and jalapeño add just the right amount of zip for even the pickiest guests. And now for my helpful tip: Being the chef who actually made this stunning appetizer, you have first dibs. Strategically grab a ginormous serving spoon — or better yet, a gravy ladle. Cut to the front of the line, load up a plate and don’t worry about embarrassing yourself — you’re going to be eating that much anyway, so you might as well beat everyone else to it. Trust me, they’ll respect you for it. In a bowl, combine the corn, chilis, red pepper, Monterey Jack cheese and fresh jalapeño. Stir in the mayo and grated Cotija or Parmesan cheese. Mix well. Transfer to an ungreased 2-qt. square baking dish and level with a spatula. Sprinkle the black olives on top. Bake uncovered for 30-40 minutes or until heated through, slightly brown and bubbly, with most of the liquid cooked off. Remove from the oven and let stand for ten minutes to set before serving. 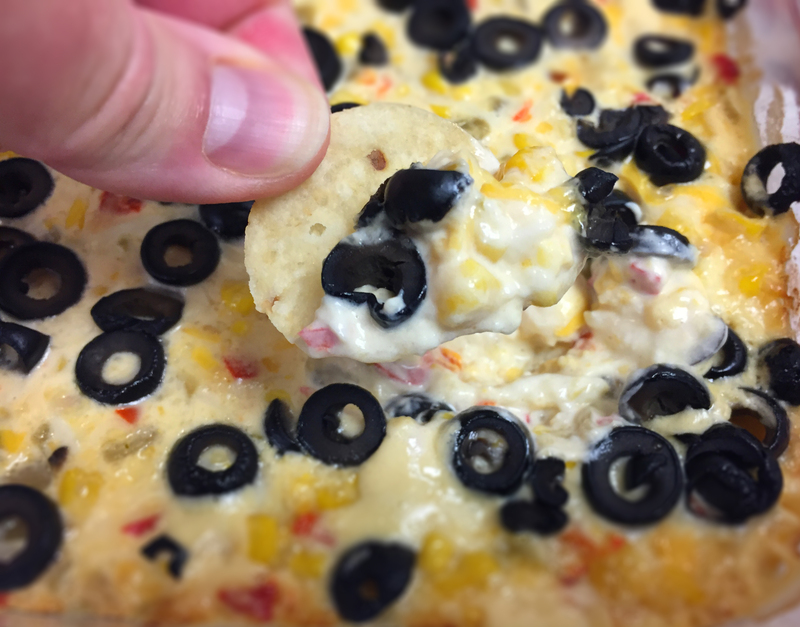 Serve hot with tortilla chips or party crackers. 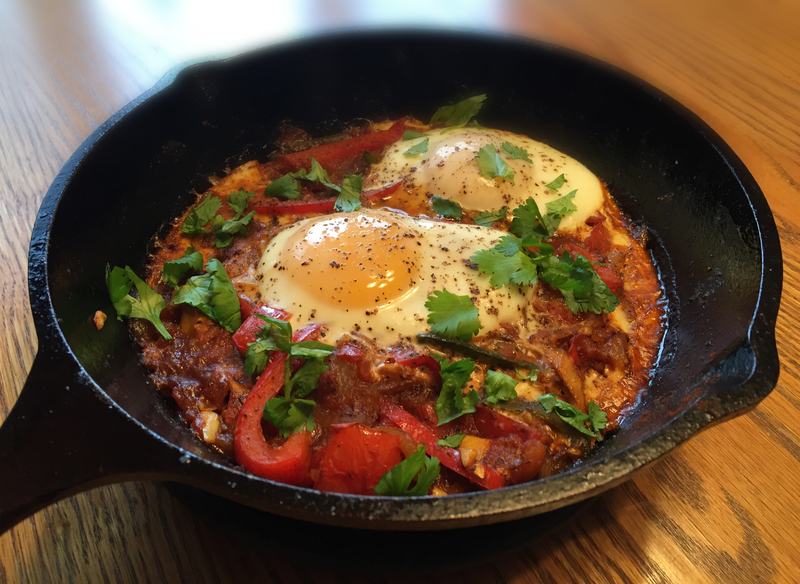 This recipe is from my grandmother, which originated in 1930’s Chicago. It’s a perfect example of Depression-era cooking at its best. 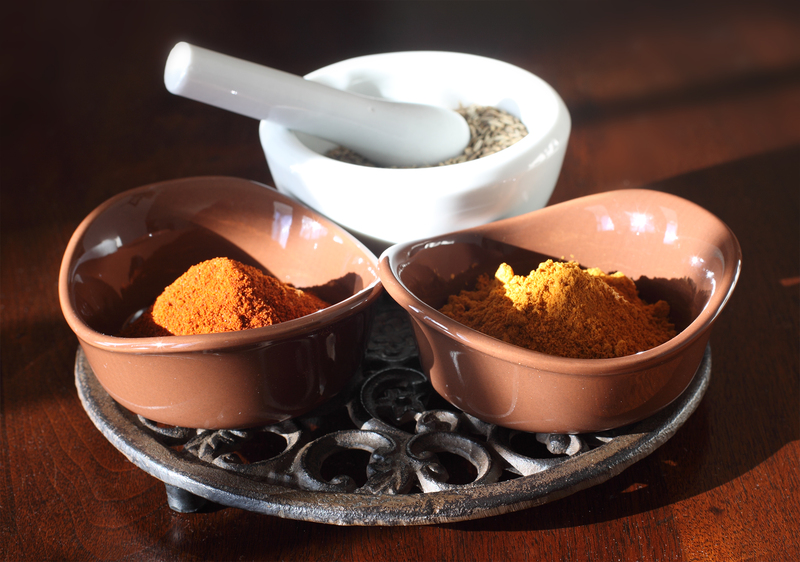 The spices include only three ingredients; it’s all that’s needed. A baked spaghetti dish that offers a refreshing change of pace — bacon. What’s not to like? 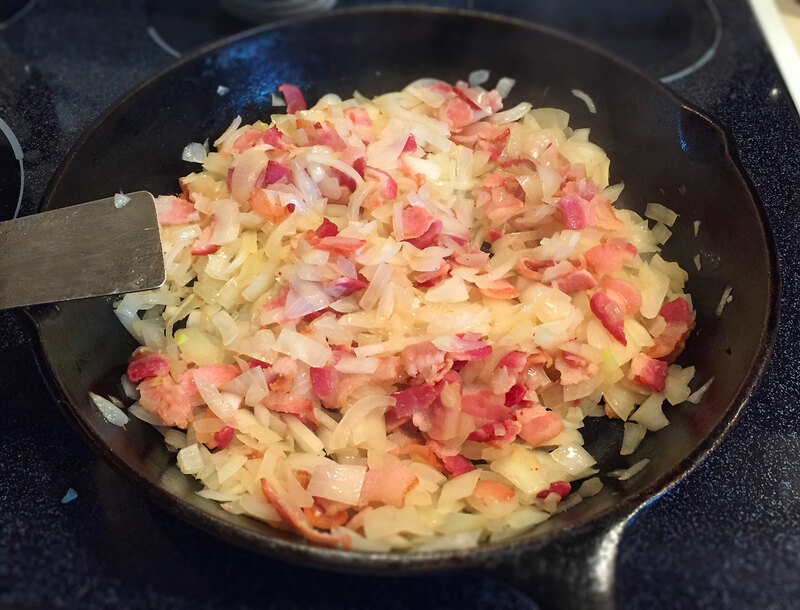 In a large cast-iron skillet, saute the bacon until most of the fat renders out. Drain off the excess fat if needed while it renders. Add the onion and saute until translucent and soft. Do NOT completely brown the bacon or carmelize the onion. Drain off the excess fat. Transfer to a large 6-quart Granite Ware roaster pan. 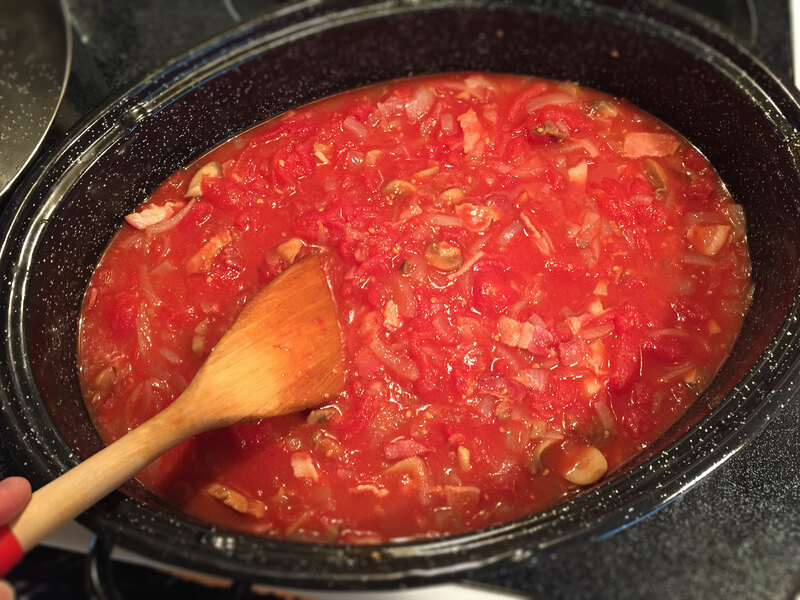 Add the crushed tomatoes and the mushrooms with liquid from the cans. Bring to a boil and then reduce heat to simmer. Stir occasionally and cook for 1/2 hour, covered. Add the salt, garlic and cayenne to taste. While the sauce is cooking, boil the pasta al dente, according to box directions with 1 teaspoon salt. Drain (set aside, covered if necessary) and add to the roaster pan. Toss gently. Bake covered for 1 hour, stirring once at 1/2 hour. Remove from oven and let sit five minutes covered before serving. Serve with a nice side salad and garlic bread. The cookware indicated is exactly the same as in my grandmother’s kitchen back in the 1930s. Some things don’t need to be improved on. This is a very regional upper-midwest recipe. It takes on many forms and is always a crowd pleaser. Enjoy at your next fall get-together. 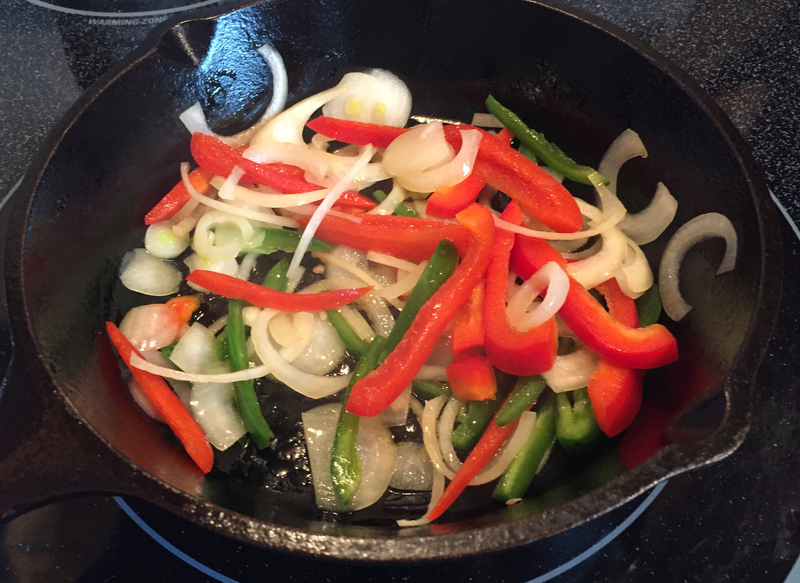 In large skillet cook the beef and onions. Drain off fat. Cook the bacon, drain and crumble. Transfer to 5qt. Dutch oven. Stir in all remaining ingredients. Cover and bake at 350° F. for one hour.